Izmulen. 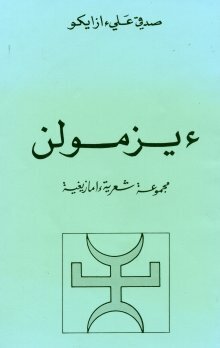 Collection of Amazigh Poetry. This collection consists of poems written between 1980 and 1991. As its title (taken from the last poem in the collection) indicates, these 18 poems are about bitter memories, those wounds to one’s soul which never really heal and which continue to haunt the poet for years. The poems have three main themes: Love in its many forms, the problems of life as well as its passion and its heartbreak, and finally, the resistance and revolt necessary for those who are passionately attached to this life full of bitterness. These themes are treated with almost blind passion. In the same way as in his first collection entitled Timitar (Rabat, Ukad, 1988) Azayku invites us to observe the world through a tragically beautiful and totally new vision. For that, he needs to makes use of two new techniques: to make a radical break with traditional Berber prosody and to invent new metaphorical images by the creation of a brand new poetical language. In this way, he succeeds in making us leave a stable and self-satisfied poetical world for a dizzying world of swirling imagery. And does this, not by changing themes – how could he when all poetry involves man’s eternal problems in life – but by breaking down the barriers of tradition, behind which these same themes have been imprisoned for centuries. The alienation of one’s self in a world which is brutally new, too new, is at the heart of Sadki Azayku’s poetry. It often appears pessimistic but the thirst for life – the word tudert (life) is omnipresent throughout – at whatever cost, in this same world, gives the collection a strong underlying theme of optimism. And it is between these two apparently contradictory visions that the author’s poetic sprit weaves its way.